The parish of Godshill covers much of the central south of the Isle of Wight. 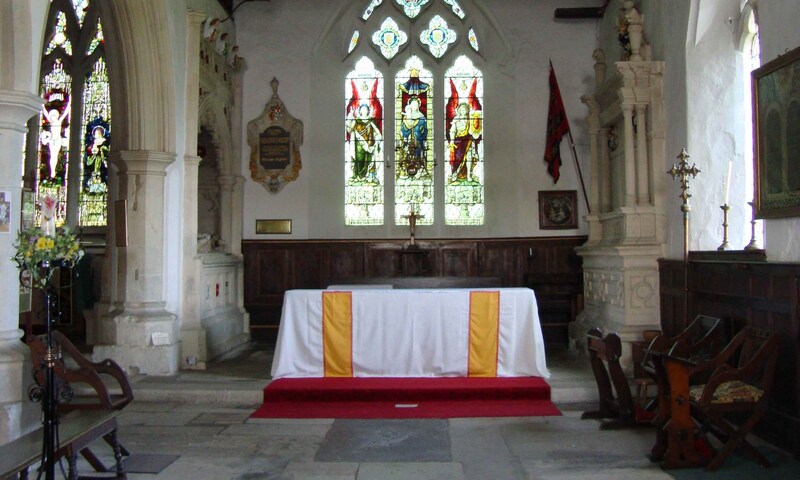 Besides the church of All Saints in Godshill itself, it also includes the anglo-catholic church of St Alban the Martyr in Upper Ventnor. The church of All Saints has an unusual plan: a double nave and chancel of roughly equal width, small transepts, porch and north west tower, mostly in sandstone. It was built in the 14th century in the Perpendicular style – characterised by window tracery that has straight-sided panels, often cusped at the top and bottom. The small south transept is late 15th century or early 16th century. Above the altar in St Stephen’s chapel is a most unusual wall painting of the same date or maybe earlier. Christ is shown on a cross of three branches, each branch dividing at the top into a further three. A curious shield-like motif attached to a fleur-de-lys is crossed by the branch below Christ’s right arm. Two scroll-bearing angels fly down from above, while a further four inscribed scrolls flank Christ. The painting is known as ‘the lily cross’. 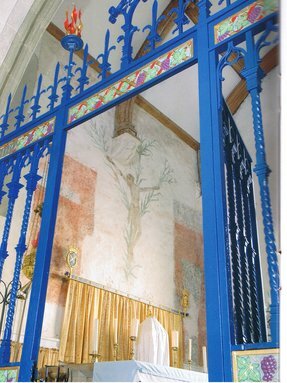 In the north chancel the former altar table is dated 1631 and the communion rails, with turned balusters, are also 17th century. All Saints has an outstanding series of monuments. The effigies of Sir John Leigh (died 1529) and his wife, Agnes, are alabaster. They lie on a canopied tomb with detailed work in Caen stone. There is a figureless monument to Richard Worsley (died 1565) who was Captain of the Island. In the north transept is grand marble monument to Sir Robert Worsley (died 1747), builder of nearby Appuldurcombe mansion, and his brother, Henry who was a classical traveller and collector. In the south nave is a monster monument to Sir Richard Worsley who died in 1805; it was erected well after his death by Lord Yarborough. To worship the Lord in the beauty of holiness, and to tell of His love to all the world. We hold to the traditional Catholic Faith as taught by the Church of England. As such we hope for our ultimate reunion with the ancient Churches of the East and West. We give to the Mother of our Lord, holding especially dear her appearances at Walsingham. Thus we pray that England once again may become The Dowry of Mary.